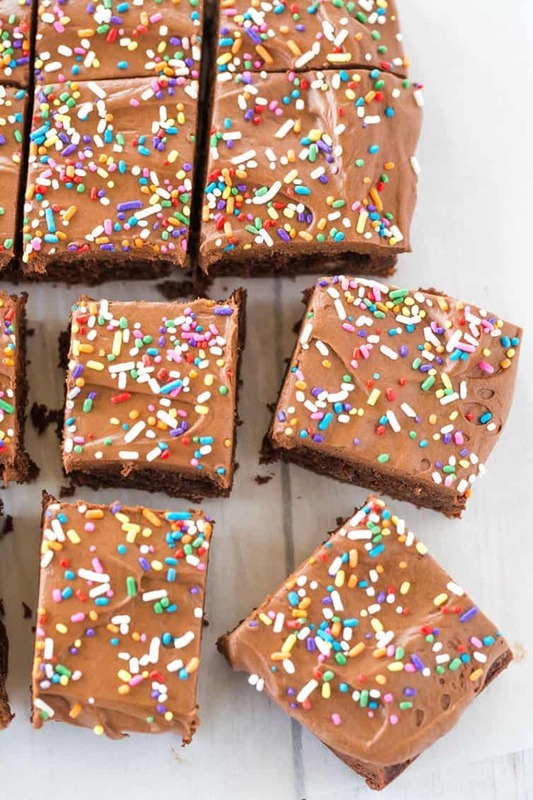 These frosted brownies start with fudge brownies and are topped with a luscious chocolate buttercream frosting (that includes a secret ingredient!). Raise your hand if you were a teenager during the ’90s. I know there have to be oodles of you out there. Ahh, the 90’s. When jeans were pegged. When flannel shirts were worn because grunge was the latest fad. When alt rock was the most popular type of music. When Beverly Hills 90210 was can’t-miss-TV. Before smartphones. Before social media. Before a completely wired world. Simple times! During my teenage years in the mid-90’s, I belonged to our church’s youth group. We’d get together a couple of Sunday nights a month and do youth group-y types of things. Sometimes it was serious and church-related. Sometimes it was flag football. Sometimes it was a service project. No matter what activity was going on, there was one constant – Judi’s chocolate-frosted brownies. They showed up every week, without fail. Sometimes, though, Judi showed up late; when that happened, she was immediately accosted by a mad throng of teenagers needing an immediate sugar fix. My brain will always and forever link together youth group Sunday nights and frosted brownies. Pretty much all of my life before and after those high school youth group years has been devoid of frosted brownies. You’d think that since I loved them so much, I would have taken it upon myself to bust open a box of brownie mix and a can of frosting and make it happen. (Those most certainly would have been the steps taken by 18-year-old me; I had yet to appreciate the joys of baking everything from scratch.) It never happened. Even after I began baking regularly, and through all of the brownie recipes that I made, a light bulb never went off. It wasn’t until I was flipping through the Joy the Baker Cookbook and landed on the page with this recipe that my mind raced back nearly 20 years (ouch, that makes me feel really old). I was immediately taken back to Sunday nights in the church basement, with a throwaway tin foil pan of frosted brownies sitting on a table, being devoured square by frosted square. 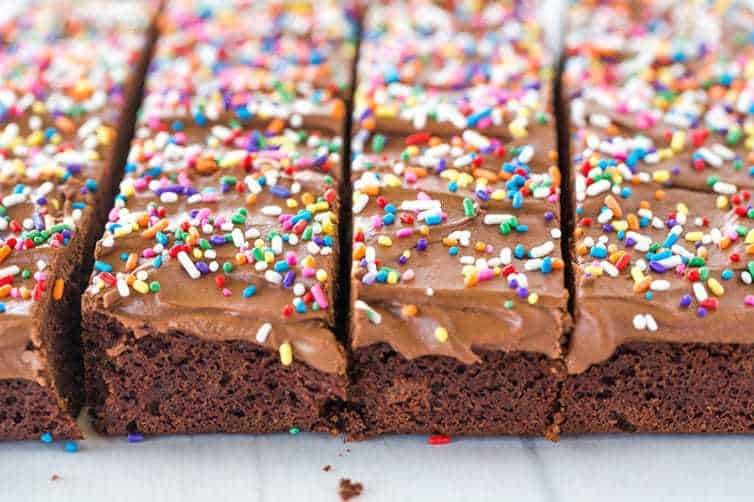 I first made this recipe nearly five years ago and had all but forgotten about it, however I have been craving them like mad since seeing frosted brownies pop up on Jessica’s Instagram feed multiple times over the last few months. After seeing them again on New Year’s, I saw that I had everything I needed for them in my pantry, and that was that. Brownies, done. Frosting, done. One VERY happy belly. Aside from the memories they evoke, I can’t tell you how utterly amazing these are. 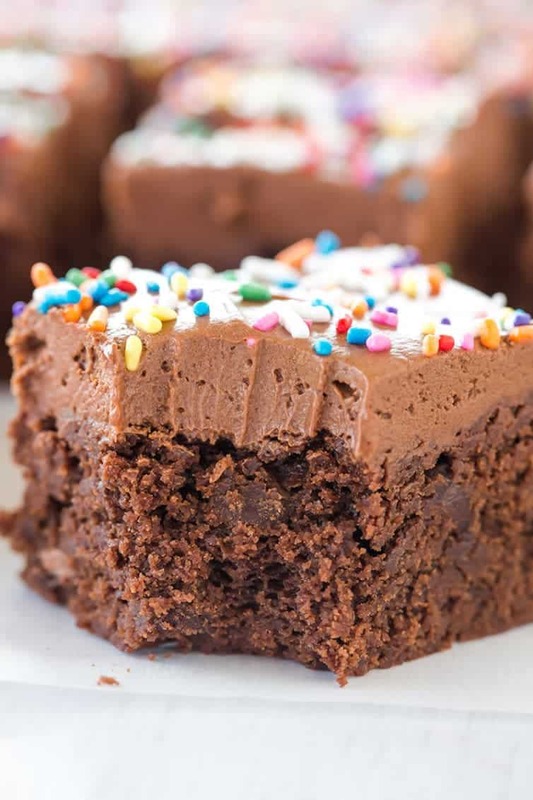 The brownie itself is rich and wonderfully moist, definitely fudge-like. And the frosting? It’s chocolatey, sweet, smooth, creamy, and perfect in every possible way. Joy says that it’s her very favorite chocolate frosting. It might be mine now, too. This is the ultimate combination for anyone who’s a fan of brownies or chocolate frosting. And if you’re a fan of both? You’re in for one amazingly indulgent treat! 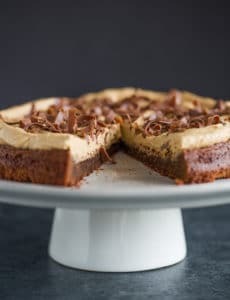 These homemade frosted brownies start with fudge brownies and are topped with a luscious chocolate buttercream frosting. 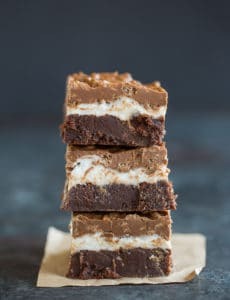 Make the Brownies: Preheat oven to 350 degrees F. Butter an 8-inch-square baking dish and line with parchment paper, letting the excess hang over the edges. Butter the parchment paper; set aside. Bring about an inch of water to a simmer in a medium saucepan. Place a medium, heatproof bowl on top of the saucepan (do not let it touch the water) and add the butter and unsweetened chocolate. Stir occasionally, until the chocolate and butter are completely melted and smooth. Remove the bowl from the saucepan and whisk in the granulated and brown sugars. Whisk in the egg, the yolk, and the vanilla extract. Add the flour mixture all at once, and fold it into the chocolate mixture with a rubber spatula until combined. Fold in the chocolate chips. 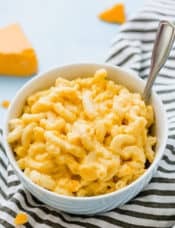 Pour the batter into the prepared pan and bake for 25 to 30 minutes, or until a toothpick inserted in the center comes out with moist crumbs attached. Allow to cool completely; meanwhile, make the frosting. To Make the Frosting: Using an electric mixer, cream together the butter, cocoa powder, and salt on medium speed for about 3 minutes (mixture will be thick). Scrape down the sides of the bowl and add the powdered sugar. Mix on low speed to incorporate the sugar, and while the mixer is running, slowly add the milk and vanilla extract. Gradually increase the mixer speed to medium-high, beating until smooth, scraping the sides of the bowl as necessary. 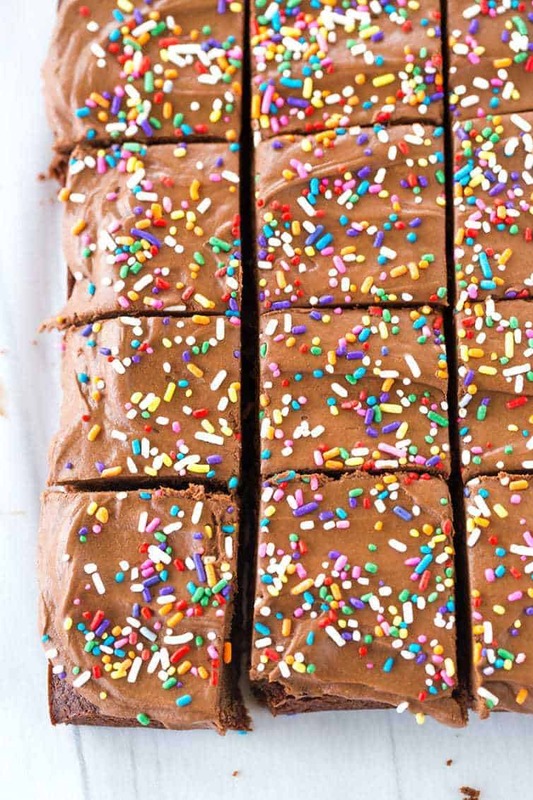 Spread the frosting onto the cooled brownies, and cut into squares. Store brownies in an airtight container at room temperature for up to 5 days. 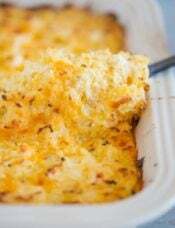 This recipe was originally published on April 26, 2012. 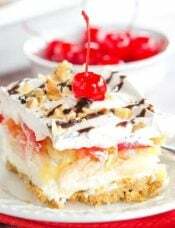 Instead of milk what about a tablespoon of buttermilk or sour cream to add interest and cut down on the sweetness? I personally prefer the sweeter frosting and don’t love tang with my chocolate, but it’s a personal preference, so feel free to alter how you’d like! This looks delicious! Any idea how the frosting would be for piping? Thanks! Hi Amy, It’s a softer frosting, for sure, but you could try refrigerating it first to get it firmed up before piping. Wow! Looks amazing! I wonder if this will work well a chocolate protein powder? I just made these, and they are all kinds of fabulous! The recipe worked perfectly and I wouldn’t change a thing. Thank you!! These look and sound amazing! 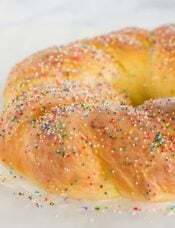 I love the added sprinkles! OHMIGOD!! I’ve just read about a chocolate subscription and this was next in my tabs! I think that’s a sign to eat chocolate, dontcha’ think? I have to give these a go, they look similar to the sponge cakes I used to have in primary school which is nice, but these probably taste a hell of a lot better!! look out, I’m getting fat tonight!! 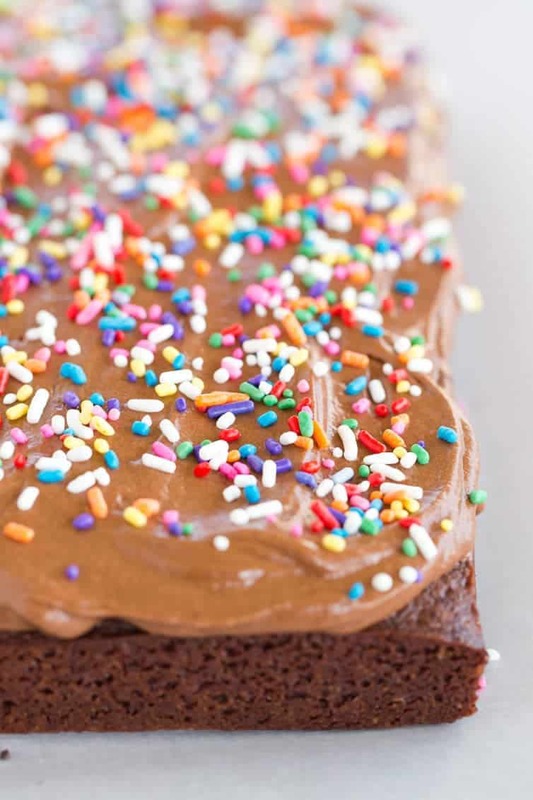 Hi there- how do you get your frosting to cut so well? Hi Maria, I slice my brownies with a large pizza cutter! 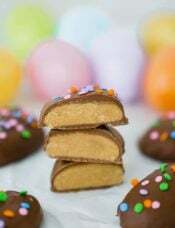 I saw these on your Facebook this morning and have been dreaming of them ever since. Yum! They look so fudgy and chocolatey. I also wanted to say, I’m loving the new site design!! I have made buckeye brownies for them 2x or more. That is a win!! I feel like I tried this recipe – either from Joy the Baker’s website or from your previous posting of the recipe and I did not like the frosting. 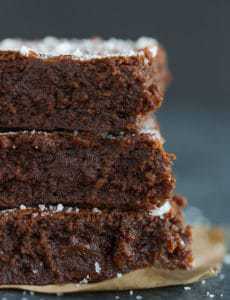 Are there any other chocolate frostings that you would recommend to top the brownies? I was a teenager in the late 90’s!!!! Totally remember ALL that stuff. Such simpler times! Loving your brownie recipe too. Oooooh I need all that chocolate!! I love when a food memory is the overarching theme in what sounds like a fun memory. I hope you ate these in your grunge era flannel. Your trip down 90s memory lane cracked me up! These brownies remind me so much of the treats that used to grace the tables at church potlucks (etc.) during that decade (sprinkles!!). So much nostalgia. And delicious looking brownies!! 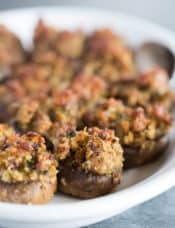 Hello,I really hope you (someone please) make some time to answer to my question because I’m dying to try this recipe. I’m not from the US (Italy actually) so I don’t really understand what Ovaltine is..is it some kind of cocoa powder with milk and sugar added? ‘Cause here we have Nesquik..but I don’t know if it’s the same thing..
Can you please explain to me what it contains exactly so I can look for a similar product? Thank you very much beforehand. Hi Diana, Here is the lowdown on Ovaltine: http://en.wikipedia.org/wiki/Ovaltine. It differs from Nesquick in that it is a malted drink, not just chocolate. There are chocolate and non-chocolate versions of Ovaltine. Thanks so much:) I actually went shopping in a big supermarket the other day and found something named Ovamaltine :))) I figured it was the same product but I don’t know why they messed with its name.. Tried the recipe yesterday and it came out delicious just as I expected..